The fight by low-paid workers for a living wage and fair treatment at work is a continiung one, and on a cold lunchtime in February I went with protesters from the IWGB union to two offices in the City of London. Both were at sites where I’ve photographed protests by the same group, the grass-roots union IWGB. CAIWU’s founders were involved with the T&G and then UNITE’s Justice for Cleaners Campaigns. As a result of a lack of democracy, they left UNITE to join the “Cleaners’ Branch” of the Industrial Workers of the World (IWW), or the “Wobblies” as they are popularly known. However, as a result of political differences as well as a lack of control over their own resources, the organisers left to found the IWGB in August of 2012. These workers formed the Cleaners and Facilities branch of the IWGB. A number of unions are now involved in campaigning for a living wage and decent working conditions for low paid workers in London, including the CAIWU, the IWGB, the IWW and the UVW (United Voices of the World), all grass roots unions with no paid staff. 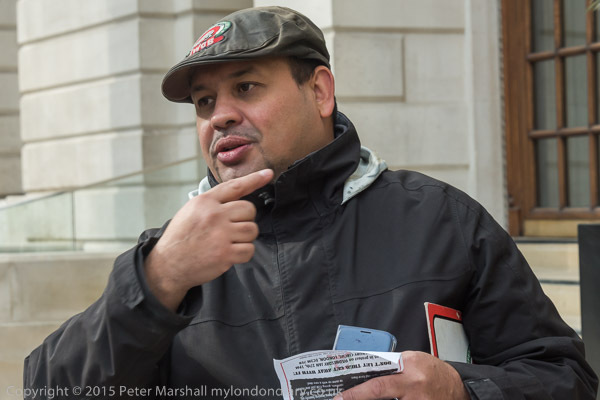 Of the more main-stream unions only the RMT and the BFAWU (with the Fast Food Rights campaign) seem actively involved at the union level, though some parts of others – such as the Unite Hotel Workers Branch and SOAS Unison – stand out for their activity. It is a confusing situation, as too is the living wage. The Cameron/Osborne government introduced a deliberately confusing National Living Wage – which is less than a real living wage – of £7.20 per hour on April 1st, 2016. The UK Living Wage campaign was launched by members of London Citizens in 2001, and the Greater London Authority established the Living Wage Unit in 2005 to calculate the London Living Wage; Citizens UK brought together lewading employers and campaigners to establish a standard model for the annual calculation of the UK living wage in 2011, and the Living Wage Foundation web site gives the current figure for the minimum people require as £8.25 ph outside London, but the London Living Wage which allows for the higher living costs here is £9.40 per hour. As almost always, cleaning is outsourced, and outsourcing only makes financial sense because outsourcing companies cut costs by paying workers badly, cutting conditions to the bone and over-working staff. 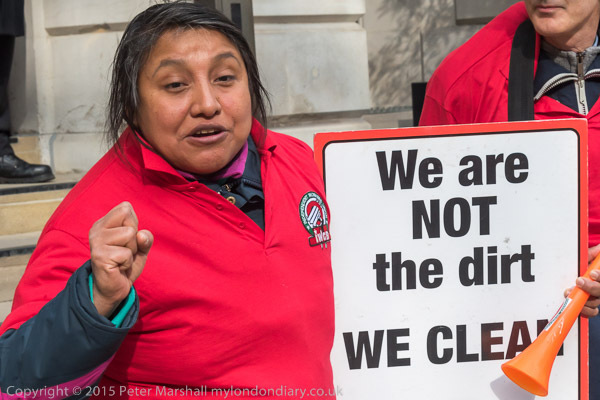 Most cleaning contractors employ managers and supervisors with little training and competence who are also badly paid and often abuse and victimise workers, particularly for any trade union activities. At Bloomberg, the IWGB say Compass managers increased the workload on union rep Hanna Abebe when she was pregnant leading to her suffering a miscarriage at work, and after she returned to work still suffering as she could not afford to stay away (cleaners only get the minimal statutory sick pay) sacked her because of her union activities. 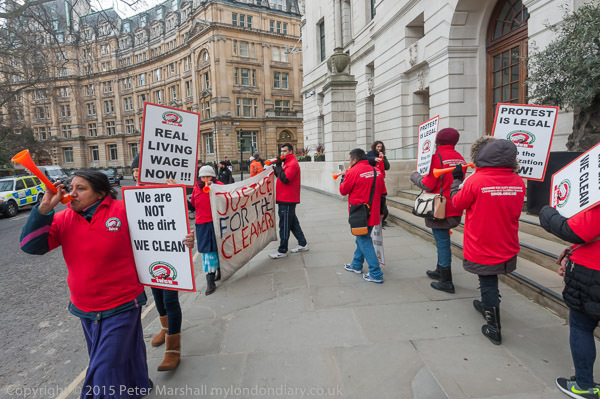 At the CBRE-managed offices at 1 Finsbury Circus, the cleaners have protested for better working conditions and proper treatment by their managers. They say the contractor CCM has abused disciplinary procedures to sack union rep Teresa Lomba and threaten others who protest. 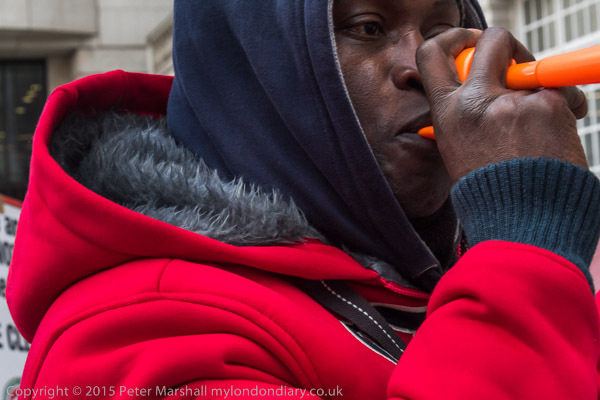 You can read more about the protests on My London Diary – see the links below. Photographically the only problem was in trying to get pictures which are at least a little different to those taken at other similar protests. 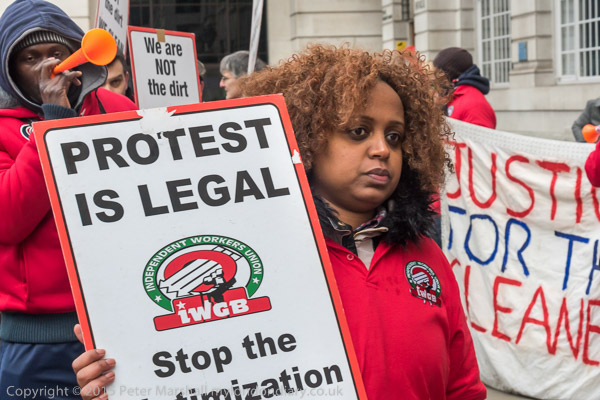 The IWGB at least have clear posters and banners with messages ‘We Are Not the Dirt We Clean’ , ‘Protest is Legal – Stop the Victimisation’ , ‘Justice for Cleaners’ and more. This entry was posted on Monday, October 17th, 2016 at 11:21 am and is filed under My Own Work. You can follow any responses to this entry through the RSS 2.0 feed. You can leave a response, or trackback from your own site.